I handformed this pottery tray from Porcelain, impressed a lovely lace imprint into the bottom of the dish and fired in my kiln. >Notice SIZE> This shallow dish measures about 3 1/2 inches wide and comes with Cork pads on bottom. This will make a Wonderful gift for a friend or keep and enjoy yourself! A cute dish to hold rings, earrings, coins, etc. 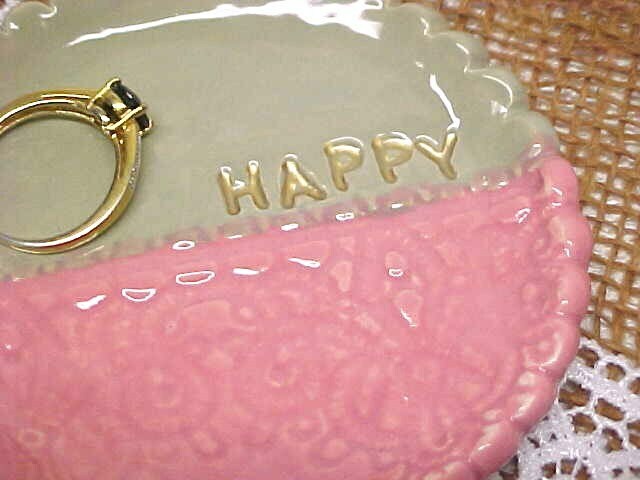 I can also make a similar dish with your chosen word, such as WISH, HOPE, LOVE, etc.l Just contact me! Thank you!